AREA WIDE -- A Wind Chill Advisory has been placed into effect for the entire listening area through Wednesday. CLICK HERE to read the full advisory. We have compiled information from multiple sources to provide you with all of the information you need to stay warm, and safe, during the dangerously cold weather. - Tell City-Troy will not be in session Wednesday. "Virtual Learning Day". Information will be sent from William Tell and TC JSHS prior to Wednesday. Contact William Tell (812-547-9727) or the JSHS (812-547-3131) with questions. - Perry Central will cancel classes on Wednesday, January 30, 2019. It will be a virtual learning day for students, with assignments being sent home Tuesday. The arctic blast expected overnight Tuesday into Wednesday could be the coldest system to move through Indianapolis in years. 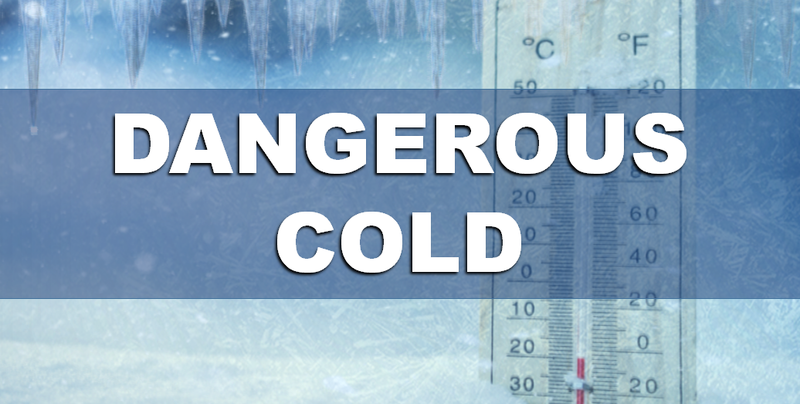 Such frigid temperatures can present a variety of challenges and dangers to residents, although many are preventable by Hoosiers taking extra steps both inside and outside of their home. The Indiana Department of Homeland Security (IDHS) and the Indiana State Department of Health (ISDH) provide the following information to help residents protect themselves and their property. Frostbite is a bodily injury caused by freezing that results in loss of feeling and color in affected areas. Damage can be permanent, and severe cases can lead to amputation. The nose, ears, cheeks, chin, fingers or toes are especially vulnerable. People who have poor blood circulation or are not properly dressed for extreme cold are at greatest risk for frostbite. Hypothermia occurs when the body temperature falls below 95 degrees.